This medium-sized goose breeds on the high arctic tundra of North America and northwestern Greenland. They migrate through and winter in several areas of the United States and Mexico, including Tennessee. Their noisy, high-flying “V” shaped flocks sound like baying hounds. This goose comes in two color forms; one white, the other dark. The white form is more common than the “blue” form. Populations have been growing exponentially, especially around Hudson Bay. Their numbers are becoming so large that the geese are destroying nesting habitat. Current estimates place the population between 5 and 6 million, a number that may be environmentally unsustainable. Description: The white morph is white overall, except for black primary feathers in the wings. The “blue” morph has a white head and neck, and a dark gray-brown body. Both color forms have a pink bill, dark pink legs, and dark eyes. Immature birds (August - January) are variable, but are usually dingy gray on the upperparts and white below, with a dark bill. Weight: 5.5 - 7.5 lbs. Voice: The call is a harsh, one-syllable whouk, harsher than other geese. Ross's Goose is smaller, has a more rounded head, and has a much smaller triangular bill. This goose is a rare but regular migrant and winter resident in Tennessee. Habitat: In Tennessee they are found around grain fields, lakes and rivers. Diet: Aquatic plants, grasses and grain. 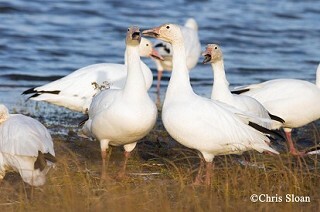 Nesting and reproduction: The Snow Goose has never been known to nest in Tennessee. Status in Tennessee: The Snow Goose is an uncommon migrant and winter resident in East Tennessee, and a fairly common migrant and winter resident in Middle and West Tennessee. They arrive in the state by late September and depart by late March. Until recently, the dark form of the Snow Goose was thought to be a different species, the Blue Goose. Snow Goose hunting in the eastern United States was stopped in 1916 because the population was declining. Currently, populations are so large, especially around Hudson Bay, that the geese run the risk of damaging their own nesting habitat, and the habitat of other species. Hunting was resumed in 1975, but this has not slowed the dramatic increases in the population. Parents stay with their young through the first winter. Families travel together on both the southbound and northbound migrations, separating only after they return to the arctic breeding grounds. Best places to see in Tennessee: Snow Geese can be found during the winter across Tennessee, especially on state and federal waterfowl refuges in the western part of the state. Mowbray, T. B., F. Cooke, and B. Ganter. 2000. Snow Goose (Chen caerulescens). The Birds of North America, No. 514 (A. Poole and F. Gill, eds.). The Birds of North America, Inc., Philadelphia, PA.